Cost: $165 for students and Southeast Guild of Book Workers members, $185 for general. Workshop description: In this combined bookbinding and letterpress printing workshop, participants will exercise both their spontaneous and structured sides. On the first day, we will embrace improvisation on the press as we experiment with various methods of creating layered imagery- using pressure printing, monoprint techniques, and the printshop’s collection of large wood type. On the second day, image and structure will combine in unanticipated ways as we integrate these printed sheets into several small book structures, paying attention to precision as we learn variations on the pamphlet, folded single sheet, and long stitch bindings. Throughout the workshop, we will take note of materials- investigating papers appropriate for both printing and folding. No experience is necessary, but some bookbinding or craft experience would be helpful. 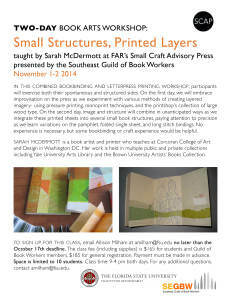 Sarah MacDermott is a book artist and printer who teaches at Corcoran College of Art and Design in Washington DC. Her work is held in multiple public and private collections including Yale University Arts Library and the Brown University Artists’ Book Colection. How to sign up: Email Allison Milham at amilham@fsu.edu no later than the October 17th deadline. 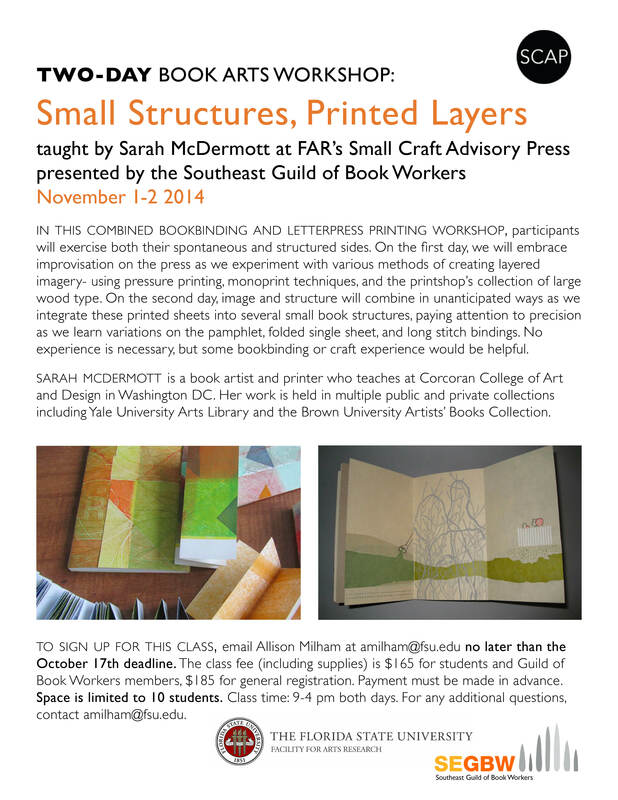 The class fee (including supplies) is $165 for students and Guild of Book Workers members, $185 for general registration. Payment must be made in advance. Space is limited to 10 students.Class time: 9-4 pm both days. For any additional questions, contact amilham@fsu.edu.